Are you the dude playing the dude disguised as another dude? Kim Hollis: Tropic Thunder ended The Dark Knight's reign at #1 by earning $25.8 million in three days and $36.8 million in five days. Should Paramount/DreamWorks be pleased with this result? Max Braden: I guess summer is over. I'd have expected twice that if it had been an early July release, and this was a big budget movie. It's almost better to be able to say they beat Pineapple Express than Batman. Shane Jenkins: I'm with Max on this. Its original release date was July 11th, and I think being punted back a month might have halved its gross. 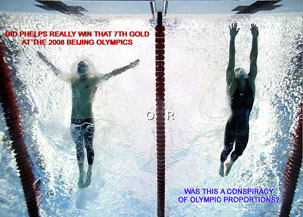 I also suspect that Ben Stiller does not have a Michael Phelps poster hanging on his wall. Reagen Sulewski: I doubt that sales of rope are up or anything, but it's a fairly mediocre result for a film that had starpower up the yin yang and one of the summer's hottest figures in a resurgent Robert Downey Jr. At the same time, Ben Stiller has been very hit or miss and a lot of his fame has come from films that showed impressive legs after the fact. So this may just be par for the course. David Mumpower: I don't believe Paramount can or should be pleased with this result. They clearly pushed this title back in order to give it breathing room away from The Dark Knight while also hoping to coast off the new-found popularity of Robert Downey Jr. The end result is an opening on a par with Along Came Polly for a title that also features Kung Fu Panda and Iron Man. it should have done better. Period.